* Package weighs 100 grams (3.8 oz.). 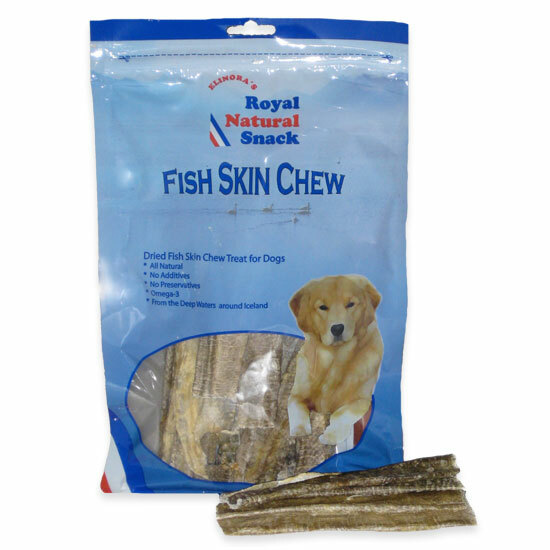 This fish dog chew is made solely out of dried Icelandic fish skin....with all those little scales removed. It is a pure natural product without any additives or preservatives. About 77% of the dry material is protein and the rest is mostly fiber. It is very healthy for dogs and especially beneficial for the dog's teeth and fur. Resealable 3.8 ounce package contains 20-25 pieces. Ingredients: Dried Icelandic fish skins.